We are constantly coming up with new ways to keep our electronic devices protected. While our IQ Shield is designed specifically for flat screen surfaces, we’ve also engineered a film that is able to completely cover your entire Huawei Honor 5X! Our IQ Shield film is pliable, allowing it to wrap itself against round edges and corners, but tough and highly durable to withstand physical wear and tear. Virtually invisible to the naked eye, our IQ Shield film also utilizes four layers of coating: a UV protective coating to prevent the film from yellowing, a thermoplastic urethane layer for transparency and elasticity, a tough protective liner and an advanced adhesive bottom layer. Each IQ Shield is specifically designed for particular devices, and are tested thoroughly to provide you the perfect fit. If you have received a defective product or if the film has become permanently damaged over time, we will happily send you a brand new IQ Shield screen protector or full body skin. Please note that the IQ Shield Lifetime Replacement does not cover items that have been mishandled or damaged through installation errors. That includes imperfections like air bubbles, dust, dirt or fingerprints getting caught underneath the film, improper alignment and stretching of the film. We encourage all customers to read our instructions thoroughly before installing your IQ Shield on your device. For more information, please visit the FAQ. Exposing excessive amounts of water or other liquids may cause harm to your device. 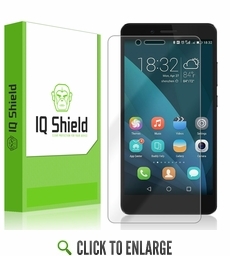 IQ Shield will not be responsible for damage caused to your device due to excessive use of liquids or improper installation. © 2016 IQ SHIELD. All rights reserved.